All Small Business Need Today a Proper Internet Presence Using Website Tool Helps You Tremendously. MidlifersWebBusiness.com Gives Free Guidance. with website tool and the "4 pillars"
How can you expect that your small Business should be easy to find by all your potential visitors and customers, without first display a proper Internet presence?? 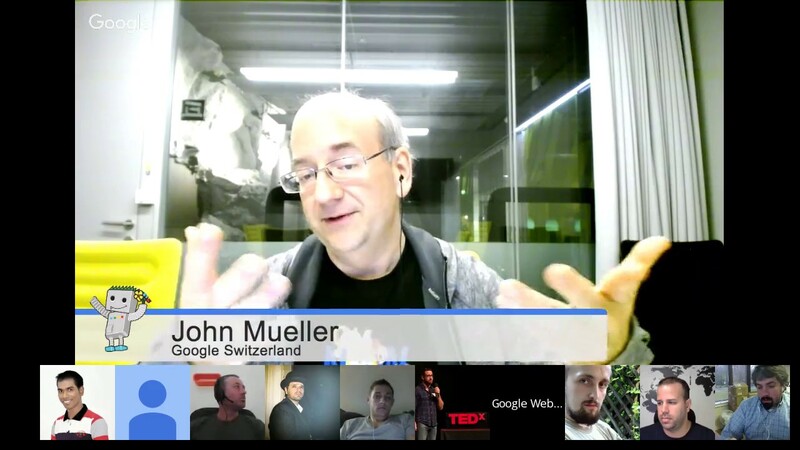 To be honest i will say, by giving your small Business an "4 pillars" internet presence, means that you in fact focusing first on your users..
John Mueller: Says small Businesses dont need worry about using Do-It-Yourself Platforms. MidlifersWebBusiness.com Gives Free Guidance. I strongly believe that all small Business need to install the "4 pillars", to have a fair chance to be found in the today and in the future of loud noises on the Internet. The main purpose of my website, is to give you as a small Business owner, free tips and guidance about Why and How you can tailor made, all by yourself, your user and mobile friendly Business sites.. I concur to SoloBuild It, that says that today anyone can throw up a professional-looking-Business site... Several big companies, spend a ton of time - money, to make you believe your site or blog is your business... The result is ??? The research and planning stage.. The creation of your home made, high-value and relevant content for your Business site and Social media..
Getting web traffic and increase that traffic.. The fact is that people today, regardless of country have access to internet and smart mobile devices everywhere and all the time. With help of their smart mobile devices, people on the street have very advanced equipment to search and find small Businesses..
What type of internet presence can your small biz, offer your potential internet searchers, in order to find you? As i have said, more than 50% of all small Businesses have today, no one or a very poor internet presence. Make sure your Business, not so easy gives away potential visitors and customers to your competitors, by not be able to be found by web searchers..
Having those "4 pillars" installed, means also that your small Business sending out strong signals that it's a honest, serious and professional Business, that always focus first on the Users.. Most small Businesses that create a proper "4 pillars" internet presence, can see an increasing web traffic by over 50%, and sales with over 20%. And of course for brick-and-mortar the number of visitors and customers to rise.. 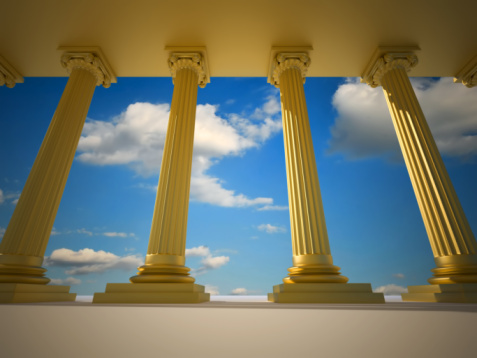 Install the "4 pillars" for Small Businesses. They hold up your whole internet presence. MidlifersWebBusiness.com Gives Free Tips and Guidance. But don't worry. Those "4 pillars", are very quick to install and to daily maintain. You will simply be able to create a beautiful designed and very functional internet presence, that your potential visitors, customers and Google will Love. 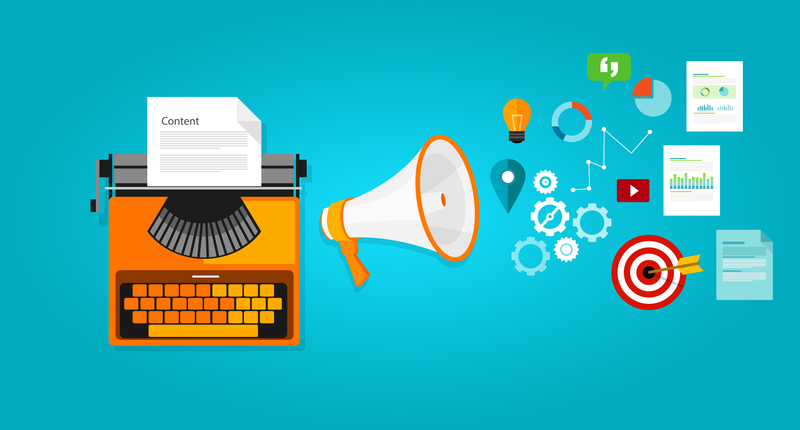 Become a problem solver, overfill your sites with your own "home made" valuable content. That type of unique value that only you can present, written with your own voice and your personality. To market your small Business, you should use a mix of paid and free marketing and search Results.. Further down in this Article, you can read more about the "4 pillars". Focusing first to create content and posting, for human beings.. Do not get caught in a morass of complex web-technical solutions, tons of different web analytics.. .Build those "4 pillars", create valuable and relevant content.. The clear fact is, this business and website tool will challenge the status quo for your internet presence, because it will allow you to tailor and to daily handle an complete Business website. It is much more easy to manage, and inexpensive, than other tools of its kind. The best part is that even if you are the "newest newbie," you can easily handle it. Without absolutely no doubt, need all small businesses a Website. But in 2016 still only 46% have an e Business site. MidlifersWebBusiness.com Mission is to Give You FREE Tips and Guidance. Why is this website tool, so unique in the market? I Believe it is an huge problem solver, because there is no restrictions and all you need for your e Business is already included. It's tailor made for small Businesses, it is easy to handle even for the "newest newbie". But at the same time there is functions for skilled web programmers, to run wild. There will be hard for you to find a similar website tool of its kind, to that price, in the market. So come along, small Business owners. The purpose of my website MidlifersWebBusiness.com is to help you, to give you tons of Free Tips and Guidance to create a proper internet presence. So Let's build and have fun.. It's Quite Obvious Why Your Small Business Shall Have a Proper Internet Presence. Focus Always On The Users. MidlifersWebBusiness.com Gives Free Guidance. My advice have always been crystal clear, the first all small Businesses should focus on today 2017, is to establish a rock solid "4 pillars" internet presence. Far to many have a poor or non existing internet presence. All of those will be left behind, by the competitors with an complet online presence. Those figures above and the full report , at Search Engine Land, gives a clear hint, why and what you as a local small Business owner should start with. And it's today simple and inexpensive to perform, by yourself. To own and have control over your small Business, is for most entrepreneurs the most obvious. Well today in 2017, your Business website is your own business in digital version on the Internet, don't you want to have full controll of that? 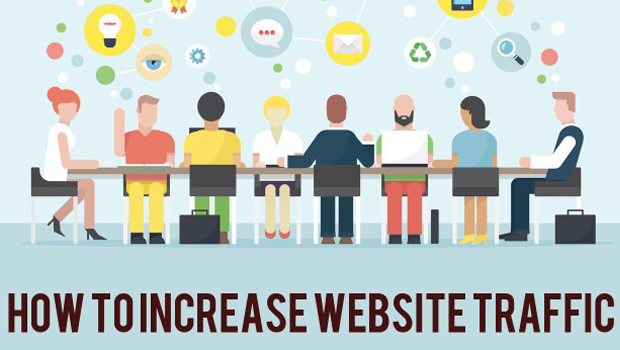 A website tool is as important for your visitors and customers as for your small business. I Believe web tools for your small Business, is an huge problem solver. And one of the basic conditions to create the website, and to handle the daily maintenance of your mobile friendly Business site. 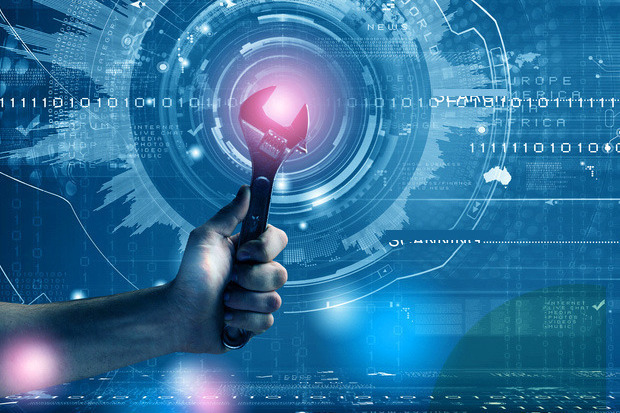 So therefore we can also say that website tools, has a crucial importance to your potential visitors and customers genuine user experience.. Nobody questions that a car repair shop has and use real tools, to build, repairs and maintenance of vehicles. I Believe that it must become as natural to all small businesses, in today's digital World to use digital business tools. Based on my own experience I know that most small Business owners have different problems. They are very busy, maybe have inadequate web technical knowledge and experience, and not a budget that allows them to have its own marketing team. And far too many small Businesses, still can't see the need, for a proper Internet presence. That's why My site gives Free tips and Guidance. 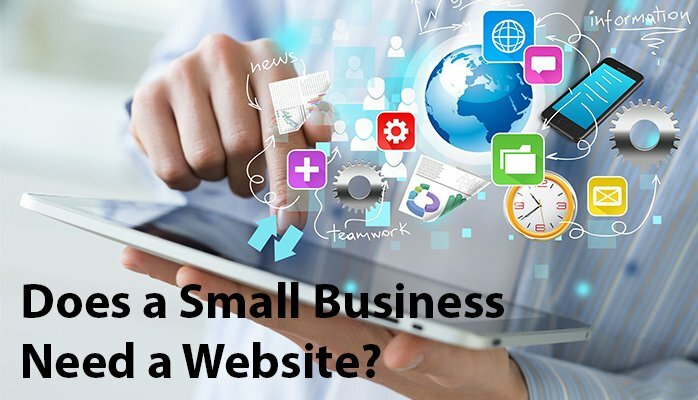 There is no doubt that all small business need today a business website, so with this uncomplicated and inexpensive tool for small businesses, It's simply the perfect solution. No matter if you are a small "brick and mortar", or an Solopreneur. Your potential visitors and customers expects that you can provide relevant value and real internet presence. 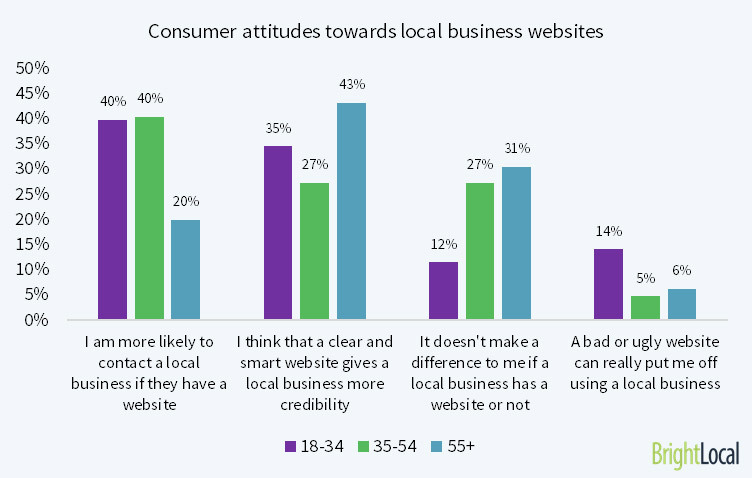 According to many survey only 46% of small businesses, have today a real internet presence. But soon will a majority of your potential visitors and customers have a Smartphone and access to internet. We all know that people use their smart devices to search for info, to find businesses, products or services.. Sorry but there is no bright future for a small Business no matter in what country, unless you can offer your potential customers an Internet Presence. This website tool, and the whole of my website that is loaded with Free tips and good advice, will help you tremendously to create and maintain a complete Business Website. As i have said.. Those web design tools, will help you solve problems. You can put 100% focus on your users, to give them a surprisingly positive experience, to help them, to solve their type of search intent. It does not matter if you are a beginner, or what age you are in, as i have said, these website tool is special designed to be very easy to handle for small businesses. It will play an crucial role so that your Online or "brick and mortar" Business, can be found on internet and increase web traffic. Today no one raises questions about internet's importance. 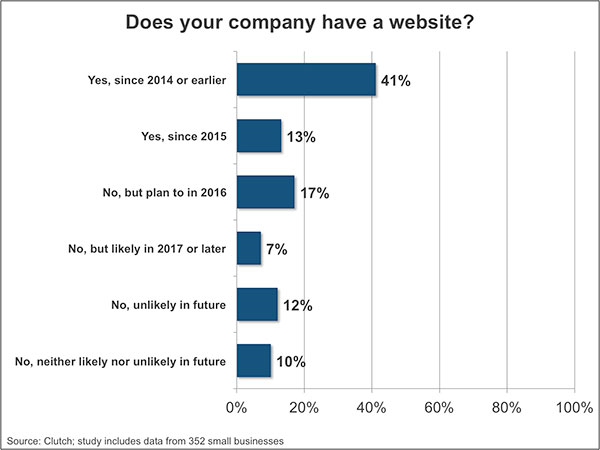 So in view of this, I am very surprised why not 80-90% of all small businesses, already has a complete Business site, in 2018. It must be 1000 times better to have those "pillars" installed, before your small Business begin to suffer, because of your target audience, frequently discover tempting offers from your competitors complete internet presence. A survey published of the Research Company Clutch, where they asked 350 small businesses with (1-10 employees inclusive owner) with an annual turnover, less than $ 1 million. Below you can see for yourself the results. One can think, that in the USA where the survey is made, should all the conditions to be nicely in place for all small businesses should for long time ago, already have got a complete Internet presence. It is very surprising that so many small businesses Not cutch up with their potential customers, Internet behaviors. MidlifersWebBusiness.com Gives Free Internet Presence Guidance. Small business owners, who were born after 1995 and has grown up with the internet and websites, would probably given completely different answers in this Survey.... I think it's a combination of reasons why small businesses, don't already have an e business, and not necessarily exact the reason in this survey. I run a small "brick and mortar" in 30 years, before I make a Midlife Career Change. I then thought as the majority of the small business owner. 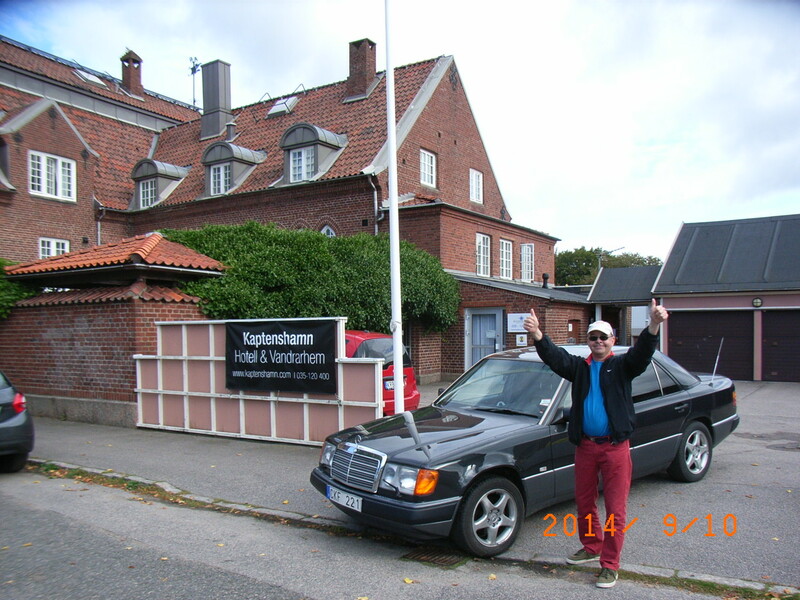 Very busy with the everyday "brick and mortar" life, we have our fixed customers so we don't see the need,, but of course many have quickly thrown up a free blog or Facebook site, so they think "Wow.. now i have real Internet Presence". And the reason is that many small business owner have heard and read many years ago, that a business website is very complicated, requiring web technical knowledge and is also very expensive. Therefore, many small business owners just forget it, and have not considered it later.. But as you can see in this article, the technical development today have taken huge steps to simplify, and also to make it very inexpensive, so even the "newest newbie" can today build and maintain a complete business website and e Business..
A website is not relevant to their Business and/or Industry. The cost of a Website. 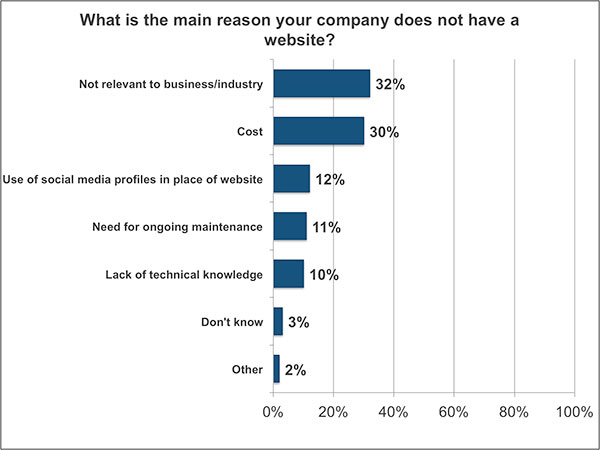 The largest reason in this survey, why they not having a proper website was: Not relevant to their business or industry. Well.. Poor small business owner, you may wonder in what century they living in? Because you do not have to be rocket scientist to find out, for all this has been talked about in many 10,000's of times in most countries: newspapers, on radio and television programs and of course the Internet. Many studies have shown that over 70-80% of today's consumers regularly, do an Internet research to find: Information, a business, a product or service before they finally make a purchase decision, often using their smart phones to do a quick internet research. This applies to all countries, not only in the USA and Europe. Internet and websites have been around for many years now, but it is during these past 5 years, that the real revolution has taking of, and everything has gone fast, very fast. The expansion of the internet and mobile broadband, new and advanced mobile devices such as smartphones, social media, the fast-growing middle class in many countries, with bigger purchasing power. Everything of this is today connected, and will constant created new conditions for small businesses, Having a proper internet presence, is no longer a option you can afford to ignore. 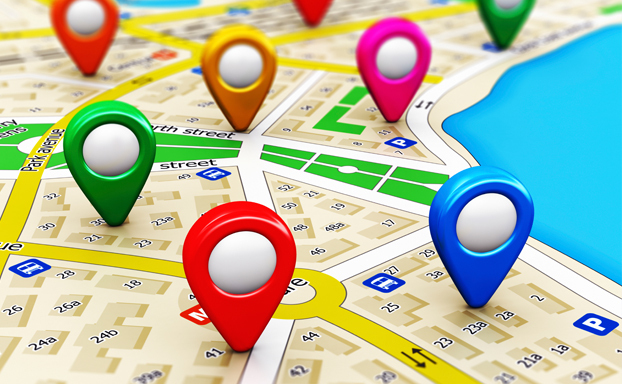 Your potential customers expect to find your Business site. As i have said, The new and future generations, small business owner, born after 1995, who have grown up with the Internet and websites and website tool as a natural part of everyday life will not see, "relevance" or "cost" as an Reasons at all, for not to have a Business site. And that is quite logical in this digital age. I Think. That the cost is the reason, is just a bad excuse. Small Businesses Can Get a Complete Business site, for few dollar/month. the cost is second biggest cause. That the cost of a website, is the second biggest cause, I think, is very surprising. The predominant largest majority of all small business in all countries do not need a super advanced Business site. What all small businesses needs, is a complete website, there your outstanding, valuable and relevant content can be found, where potential customers also can purchase and choose e Commerce. can social media be a substitute? Other reasons are that many already use a social media site, as an Internet presence instead of your own business site. But when it comes to Social Media strategy, many see on social media for the wrong thing. A social site is a source for increase web traffic to your Business site, to act as a relationship builder, where people make recommendation to your small business, comments of your business, products or services. On Social media your business name will be mentioned in people's everyday conversations related to your Business .. But remember you can not own, your Social media site in the same way as your own business website. Your social sites it's not a place to monetize, or for heavy sales pitch. The content on your social site, shall inspire and entice your visitors to click on a link, that quickly take them to your own mobile friendly business website. There it's you who is the captain and decides the content, and it's up to you, if you want to monetize your site. Where your customers can also choose to make e Commerce..
During 2016 Facebook have developed very much, they have really worked hard to put things right, especially for small Businesses. I believe for most small businesses regardless of industry, Facebook is the Social media, where you already will find most of your potential visitors and customers. Today i think many small Businesses use their facbook business site, as its blog. And why not, most of your potential visitors and customers are already on facebook. So the possibility that they will see and find your business, it's quite big..
Use your facebook site, when for example you get new products, take a foto write some relevant lines, with a link to your business website, there you presents a nice offers.. When you are ready, you shall also push the blue "boosting" button.. So as you understand, your Social media sites have its own important function in 2018. But remember they can Never replace your Business website. I have written an separate article. Learn how Social Media will benefit your small Business. The lack of technical web knowledge. 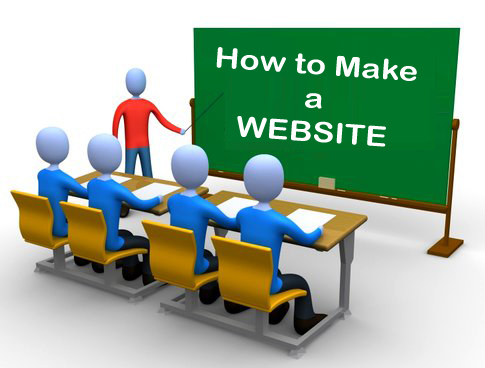 Yes of course for 8-10 years ago, you must first become a web programmer to create an Business site. ... But certainly not in year 2017, I myself have not very much web technical knowledge and I saw it as a major hurdle. Today, there are many possibilities, it comes to finding the website tool, that suits you and your small business best. what about mobile friendly website. Your Business website is of course the digital version on the internet of your "brick and mortar" business. 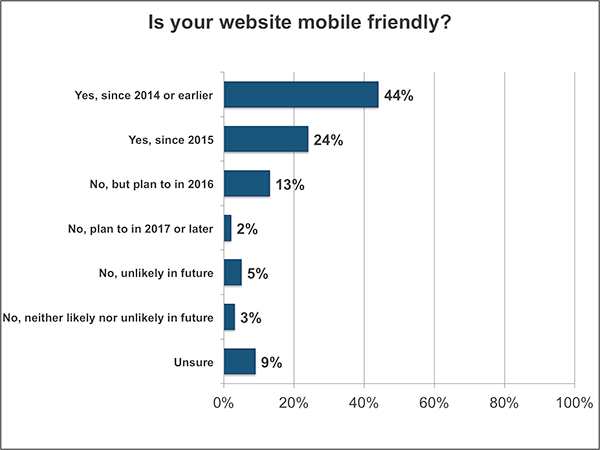 In the wake of the enormous development of smartphones and other mobile devices, it would be natural and obvious for any small business to provide a Mobile Friendly business website. It is all about give your users a better experience. So back in April 21 in 2015, Google made an update, that is to say that the websites are not mobile friendly, will get a poorer rating. Google has so far, selected a smooth transfer policy. But most certainly, Google will take further measures against websites that are not mobile friendly, it's just a matter of time. To be mobile friendly is very logical, because so many of your potential visitors use their smart phones or other mobile devices, when they will visit your Business site. Having a Mobile Friendly Business site is about being found when potential customers use their Smartphones. MidlifersWebBusiness.com Gives You Free Guidance. When consumers use their smartphones and click on a website that is not mobile friendly, chances are very high that they simply quickly jumps to one of your competitors that have an mobile friendly business site., because it is very difficult to read a website that is not mobile friendly. Google also provides benefits to websites that provide a better user experience. final words on this survey. Many of us lack the same knowledge and natural "web savvy" feeling, which the younger generation have plenty of. Because they are born with the Internet, I myself have a son belonging to precisely this young, Millennials "web savvy" generation, so i know and understand. WHAT CAN BE MORE CONNECTED TO A WEBSITE, THAN INTERNET SEARCH! Here you can listen to three boys: Martin Shervington, Mark Traphagen and Eric Enge. They have Extensive knowledge and experience When It Comes To Internet Search and "how your potential customers, find your small local business". the cards on the table. Let's look at some Comparison. How to build a website? That can be helpful for your audience, and solving their problems. Many small businesses owner do think that it still requires huge specialized knowledge, experience and a thick wallet to build a website. But this is no longer the case, the development has been fast, and today can even the "newest newbie" build a business website, and in addition it has also become very inexpensive. What I mean is an website for small businesses. Because large companies have a completely different need of a more complex and tailor made website, and they have also other economic conditions. So what is a business website for small businesses in 2017? And whats in it for you? It simply is your small business digital storefront, that can fulfill expectations, as your digital visitor and potential customers have. Today's consumers regardless of the country, are on the internet almost 24/7 and make for example searches using their smartphone or a computer to find a business, products or services. Many have asked me if there are some limitations with this website tool? No.. It is your own website or blog and your own e Business, that you own, what products or services your small business should be about, well.. it's up to you decide that. But, as you probably understand, there are ethical and legal laws and regulations locally in your country, but also globally, and of course you must follow them. In terms of design and appearance of your website or blog, there are no technical limitations, So it's only your own imagination that sets the limits..
Can you have ads on your website or blog? Unlike many other website tool and blog tools providers. You can of course advertise, put-up ads and write about what you want, as much as you want, It's your own Business site. There is no restrictions ..
As i already mention above, the "4 pillars" are a the foundation of internet presence for small Businesses. It is all about to be heard today in the high Internet noice, there is no doubt that all small Businesses, regardless of size, industry, and the country, now needs a real internet presence. Don't so easy give away, potential visitors and customers, to your competitors that already Implemented Those "4 pillars". Remember to create those pillars, it's not about rocket-science. It's very inexpensive and easy to create and handle all by yourself..
As you can se, there is no external blog. Why? Because i am convinced that a majority of your potential visitors and customers is today a Facebook user. Recently Facebook have working hard to make small Businesses satisfied, with lot of new functions. To use Facebook as your blog, will save you money and time. After all i think a blog main task, is for the fast and short news updates, that you also of course should "boost". The whole point with "4 pillars" are to give you, a complete internet presence, that is very inexpensive, very easy to install and very fast for you as a small Business owner, to daily maintain.. With those installed, you need not worry if potential visitors and customers, can find you on Internet... Here you can see an example, on how the "4 pillars" on a typical small Business can look like. Your Business Website, which is verifierd with Google. Your Facebook Business site, which i recommend you use as your Blog. Your unique content, images, videos, etc, as you have written with your unique voice and personality. You regularly use a mix of paid and free marketing. For example, you should always "boosting" your Posts on your Facebook Business site. what is a "click to call" button? it generates many more customers. With a "click to call" button, there is no doubt that this small Business want to put things right, for helping Potential customers. MidlifersWebBusiness.com Gives You Free Tips and Guidance. Become a Super helpful and service-minded small Business, install "click to call". .. Why will that benefit your small Business? People today have lots of online choices, and little time, they whant to make quick actions. So when they search and finds your Business site, maybe they also have a quick question. If your small Business can offer a "click to call" button, the chance is literally twice as big, that they choose and contacting you. As you know, the number of smartphone users increases enormously, a "Click to Call" button makes it much easier and faster for people to contact your business. On internet you find lots of option, and many is also free. Just make a search at "click to call"..
SBI! Is all about you! To starting and building your own small business online. Or giving your small "brick and mortar" business, a real internet presence. This website tool, is for all people, who do not already have extensive web tech knowledge, so you by your self can quick and easy, "step by step" using an "point and click" tool, to build a real business site. You know, for 10 years ago, to building a website was almost impossible, without first being a web programmer. With this super tool, no additional installation, everything is already there. You do not have to think about web hosting. Is already Google, User and Mobile Friendly. Social media is already there. No need to Installing plugins to get more out of your site. 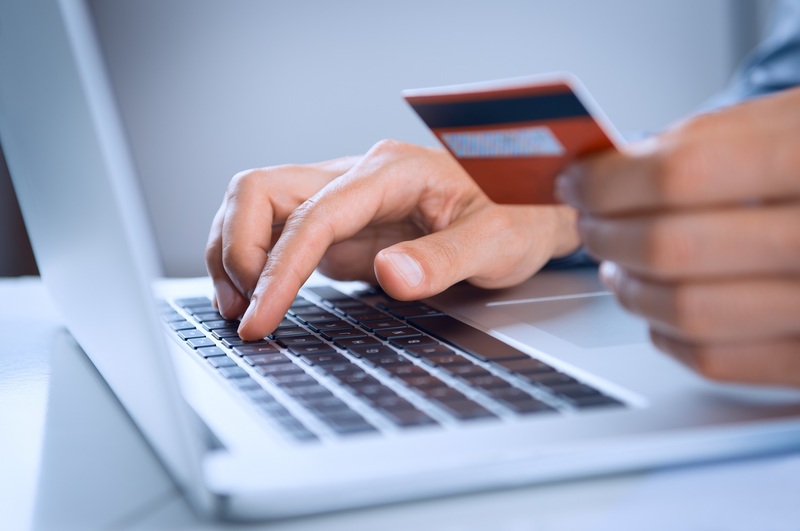 A complete e Commerce is already in place, ready to run. Payment options for your customers, ready to run. If you have the knowledge and experience, this tools is compatible with other HTML editors. This complete tools does much more than just a "ping". It tracks all spider visits. It checks that your pages are indexed. It reports rankings, too. And it does all this for all the pages you build... No extra charge. No other service does ALL this for Free. And of course... All processes, is constantly updated. No wonder that the users of this business tools is in the "Top 3%" and Outperforms the Competitors. 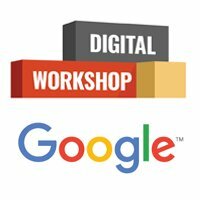 I can recommend you to take a look at the Google Free Digital WorkShop Academy. Combine it with MidlifersWebBusiness.com Free tips and Guidance. Get the Digital skills you need to grow your Small Business. I Believe this digital academy course with Google, is nice complement, to the guidance you find here at My Website. This Google digital Garage, is aimed for Beginners, Small Business Owners, Employees, Retirees and Students. For those who want to get started, sharpen their digital skills, or kick start your career with an impressive certification. But to get the digital skills you need to build and grow your small web business. You need an combination of knowledge, both theoretical, practical. However today in 2017, there is no big technical and financial hurdles for you, to by yourself build and run a small web business. And for you who already have a small "brick and mortar" business, to establish a real Internet Presence. I can Recommend you to take a look at the Google WorkShop Academy, it's FREE. 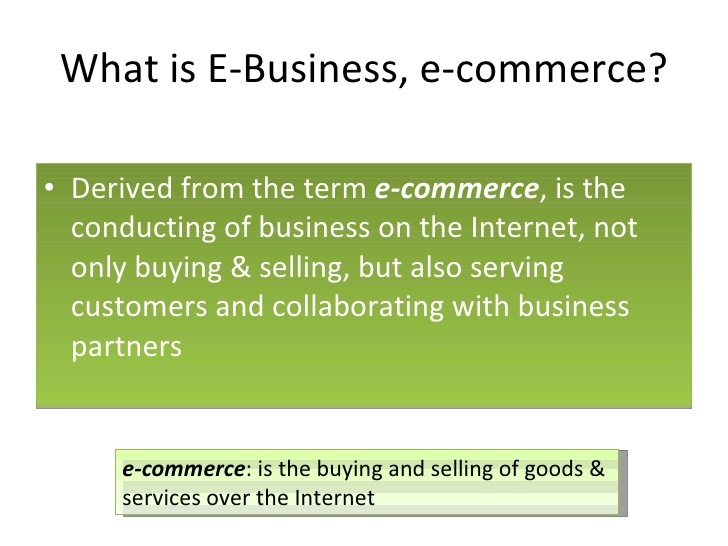 To build a web business, I Believe it is a big advantage fore you, to looking at many sources. That you step by step can pick out and learn what is relevant for you, for your own small business, in your country. Why use this comprehensive website tool? No matter what type of small business you run, if you have customers, it is absolutely essential in 2017, to have proper presence on the Internet. Your mobile friendly business site that you own, reach your target audience in the fastest possible way, when they make a Google search. It increases your web traffic and takes care of traffic from Social media and offers e Commerce as an option. . Small businesses, and especially local small Businesses has a very big potential for online success in this digital Smartphone Era. But you will only benefit by developing and maintaining a strong presence on the Internet. With SBIs inexpensive website tool, you need not worry to build your pages from scratch with technical complex coding. This website design tool, give you instead "point-and-click" tools and templates to create and daily maintain, your web pages quickly and easily, including pictures, and everything. This allows you to focus entirely on the fun and very important job to writing and overfill all your business sites with a mix of your "homemade", your valuable, relevant and genuine content, that type of information people will love and share. But of course, if you are already comfortable with all this coding tools, knock yourself out. Site Build It Website tools! is compatible with other HTML editors, so you are always free to fall back on your own tools. This gives you the maximum flexibility to create the look and feel you want on your website. The tool box includes a very comprehensive set of tools that help you build a complete and successful e Business. So sit down, fasten your seat belts, hold on tight. Without a doubt, you should now get a little taste bit of a real and honest website tool system for Traffic Building. That is completely unique in the market. some example on the business tools. • Working together with google to provide optimal functionality. • Registration, of the domain name that is included, and you own it. • Blog and Blogging tool. professional website tool and blog tools. Quite seriously, this is just "a few taste bits" of all utilities included. Many tools and features are also fully automated, and some tools work for you in the background even when you are not aware of them. For example, if you update a page on your website, it will automatically renew your Google and other search engine sitemaps. If you do not know what a sitemap is, you do not need to worry about that and many other things. Because the technology will handle it for you. This means that you can focus entirely on content creation instead of having thoughts and concerns about getting all the technical complexity of the details right. You will also receive suggestions for new topics you can write about in order to further increase web traffic, to your business site, based on an analysis of your visitor, current search traffic patterns. Good to know... Recently, John Mueller from Google talk about the advantages for small Businesses, that by themselves build their internet presence, by using do-it-yourself platforms..
SBI is not just a technical tool box, you want to learn to focus on income-generating activities while building your mobile friendly website or blog. It helps you to adopt splash as an online entrepreneur, not just someone who thinks it's super cool to post their own content on the Internet. The whole point of SBIs website tool, is for all of you without tons of web technical knowledge, being able to build a professional business site, that will generate money for you and your small business. For example, if you are a small local "brick and mortar" business that uses your time, face to face activities with your customers. By use SBI, you know that you get a perfect business website or blog, which you can easily create and maintain. I just want to mention that there are today more than 20 universities, that teach college courses with the help of the SBIs unique website tool. That gives the schools a way to give their business students, in the MBA program, a real world experience in building a functional "real world" e Business. So what can you expect when you sign up for Site Build It? ... The first thing that will happen. You get your "step by step" Action Guide, which breaks down the steps you need to do every day. So think of this as your textbook on how to build a successful e Business. They have, of course, video versions of the lessons that I can recommend, so if you are a visual learner, there are two possibilities. It is now that you will first build the important rock solid foundation and "main engine" for your small Business..
Brainstorm It.... Probably the today, most advanced and easy to manage Niche and Keyword Research Tool of its kind, on this Planet! Absolute No factor is overlooked. Take a taste bite, how to find keywords, how to find your niche, how to getting traffic. Brainstorm It! The new smart brainstorm tool, your niche and e business identifier. These keyword researcher, helps you to find potential site concepts for your online business, even if you're only starting with a few general ideas. 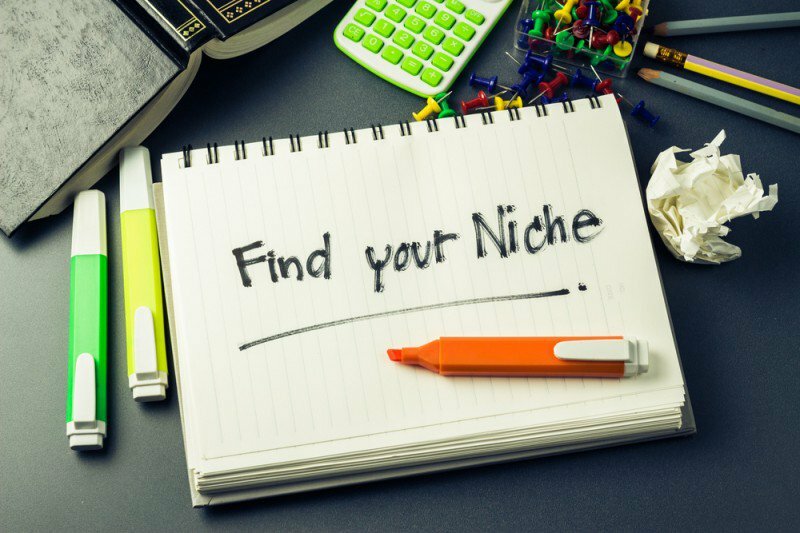 You will develop a profitable niche for your e Business, one that's neither too competitive for you to win, nor too small to earn a substantial Income. Of course, this is also an excellent tool for you, which already has a small "brick and mortar" business. And It is included Free of charge in your website tool. This means that you can reject online business ideas for topics that do not demand or those who already shows a large entrenched competition. I've said it before, but the first 4 steps, is a very important process that makes SBIs website tool so unique and distinguishes them from other competitors in the marked. It will help you to avoid launching a website or blog that is doomed from the start. There are many bloggers this Days, who could have saved themselves for lots of wasted time, money and frustration, if only they had the right knowledge, right tools, and taken the time to carefully researched their chosen niche in advance. Very fun and interesting, here you plan your website monetization strategy. What mix of advertising, affiliate programs, product sales, offering services, e Commerce, auctions, referral fee, members-only resources, and other sources of income you name it, that would work best for the type of mobile friendly website you want to build. At this point, you are already on the way to step 5 of the action guide. Many people mistakenly believe that registering domain names and monetization must be done first. To build your website skeleton. And you need not worry about making some stupid mistakes like broken links, etc... You will also now begin to add a very basic first amount of content to your Business site, and you will be trained on the very important concept of PREselling. 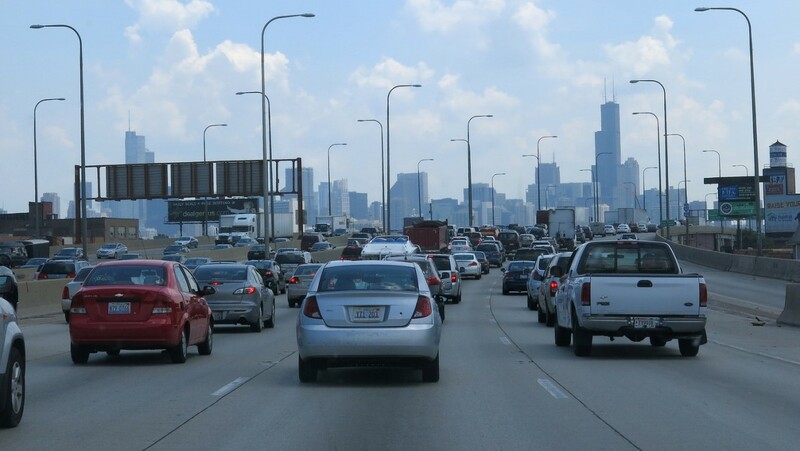 Your income is a result from traffic. If you can get the traffic, you’ll make the money. For most small businesses, building web traffic is the key limiting factor..
SBI has undoubtedly a super heavyweight tool box, for traffic building that is completely unique in the market. Without traffic to your website then you have no e Business, so traffic building is completely life-critical to your small Business. I've said it many time before, and I will say it many times again. It is extremely important for you to really "step by step" using SBI's unique website tool, to put all the pieces in the right place, the first 5 steps ..
You will learn to build relationships with your visitors, so you can create a sticky spot with consistently repeat traffic, that is to say that your visitors want to come back to your fantastic website. You'll learn about how RSS feeds work, contact forms, and e-zines. SBI website tool, provides all the tools you need to add these to your mobile friendly website or blog without having to reprogram them yourself, and without any additional charges. 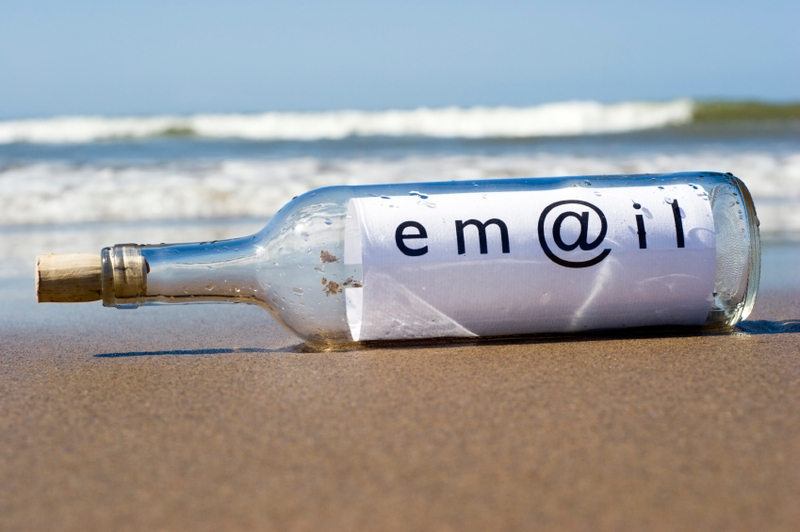 Today many small business offer their visitors a free newsletter, and it's obvious, I think you should do it. Anyway, the complete subscription management service you need is of course included, just for you to moving on. The lessons and business-building process with new business tools, continue to learn about your important "lifblood" the "search engines" and how very important it is that you also playing on the same team as Google and follows their strategy. But Always Remember.. Step 10 is the big 1. You can turn your fledgling and mobile friendly website or blog into a real and honest income generating web business activities. 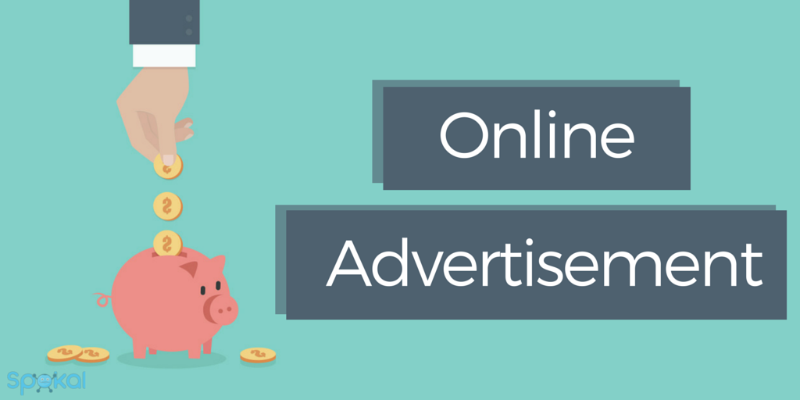 Now is the time to start putting up advertisements, affiliate links, etc, based on the monetization mix that you earlier in the process selected. You will not have so much traffic yet, so your income will be minimal at first, but now you have what you need on site, to start earning money according as your traffic will grow. And to all of you, who have built, and run a Small Business before, already know That it takes time to build a real business, there exist no "push 1 button" or "quick fix" over night success. Growing your traffic and Revenues. After you've built your mobile friendly website or blog, you will course continue to refine your site, and obviously expand the content, and gradually "step by step" so does your free traffic. But you can also, if you want it to go faster, advertise. Depending on your budget, and size ambitions of your small business. In the long run you become a content providers, so this is where you'll spend most of your time that is to say, to create unique, valuable and relevant content .. You will then be able to create a really solid foundation for your online or "brick and mortar" business future brilliant results. I think based on my experience that SBI's style is very encouraging and motivating. If you visit their site, it should be obvious. This is not just their sales style, you know it's their natural service style as well. But even with all their amazing handy website tool and their webinars and other guidance they provide, for you to be able to build a real e Business. So it will still require a significant commitment from you. But running your own business is not only a beautiful label, it's a life's style. And it is very very fun i Think. With this unique website tool, not only will you build just a website or blog, but also create stunning e Business ideas. MidlifersWebBusiness.com Give you Free Tips and Good Advice. SBI provides members-only discussion forums for each part of this process, as well as a direct customer support, so if you need further help or guidance, it's just a click away. SBI members are really in the co-mentoring, almost to the point to give each virtual group hug. For example, there is a "Submit your website for review, place" forum where you can just post a link to your new site you are building and ask for feedback from other SBIers. That is to say you can if you wish, get some extra eyes on your own business project from people who are much further along than you. Since SBI sites tend to be very niche, most members are not competitors to your website or blog, so they are very happy to help. Well as I've said to you before, if you're an experienced web developers who already have good knowledge to all this, which already gives you many thousands of dollars in returns, monthly. You do not necessarily need SBI. You already have your education the hard and long way. Well... 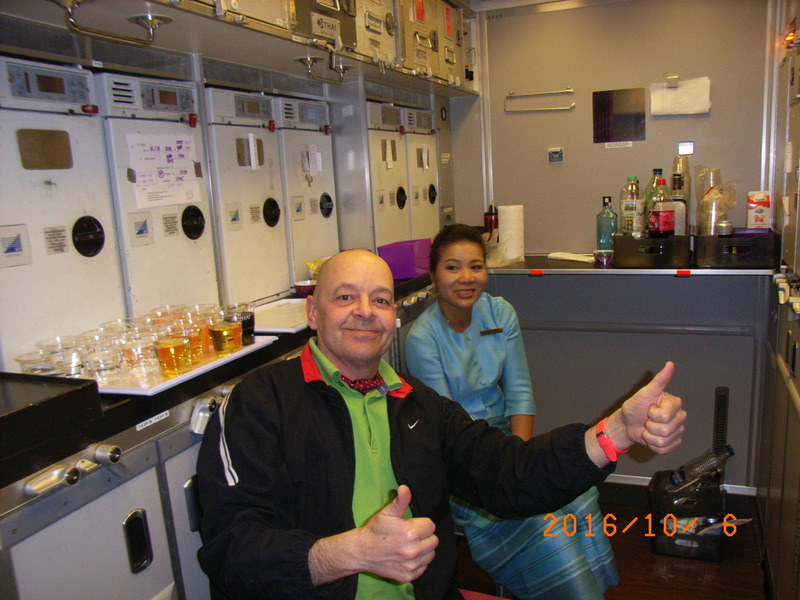 This is now a very popular service as you can imagine, with very good reason, and based also on my own experience. For every experienced web developer who has no need of the SBI, there are countless other on this Planet, who would love to just supplement their income or to completely switch to, and start with a profitable full-time job, running a internet business. .. But it has previously for most people been impossible because of the large complex technical obstacles. SBIs website tool box want to help you and remove these technical obstacles, which now makes an online business accessible to many more people on this planet. 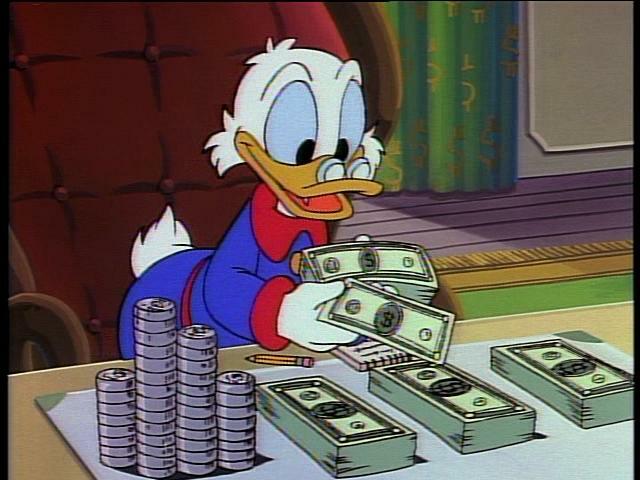 To build a successful e business, you need not be a master in the difficult technique. It is much better to delegate all the difficult and time consuming part of the business to SBIs super heavy tool box, so you can fully focus on the critical income generating activities, (creating valuable and relevant content) rather than wrestle around with the underlying important but very complex technology. You can absolutely use SBIs website tool box and build very: trendy, super cool, high-tech and professional-looking websites or blogs (without any additional upgrade COSTs), if you wish. You should know that your website design, is limited only by your own imagination, not of SBIs tool box. If your goal is to make a very trendy look to your website or blog, so it's absolutely no problem. And you are always free to use your own design tool if you wish. Here is a page where you can browse through a quick slide show with multiple website's obviously built with SBI's tool box: You see a screenshot of each site's home page, its URL, and its current Alexa ranking. Most of them have an Alexa ranking top 200,000. Feel free to visit these sites for design ideas and inspiration. The cool thing about building a profitable website or blog is that once you have done that, so it's usually pretty easy to maintain it, and it will still make you money even if you would like to let it slide for a while. So it is the start-up phase and building your website or blog that takes time..... Many people create multiple websites and blogs! 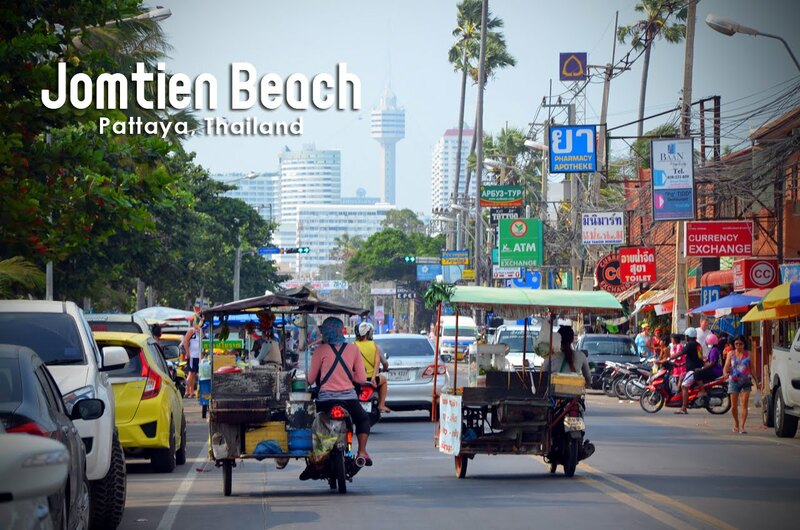 places with different themes, which is an excellent and logical approach. The more arrows you throw, the more chances you have to hit a dot. Even if one of your arrows miss their mark, you can still generate some income, just not as much as you had hoped. But remembering to complete one at a time, otherwise you can easily end up in a situvation with a handful of half-finished sites where nobody generates Money. Your investment that you are doing in time and money in this case, is not much at all, compared to the very big potential rewards you can expect. You risk much more by taking a regular "web programming college class," where you are more likely to be taught in impractical info, that you will never use in the real world. Instead of school, i make a career change, from run a "brick and mortar" i choose SBIs website tool, That allows me to continue do what I have done all my life, what interests me most, and what is my big passion, which is to run my own small business, but now in the shape of a small e Business. 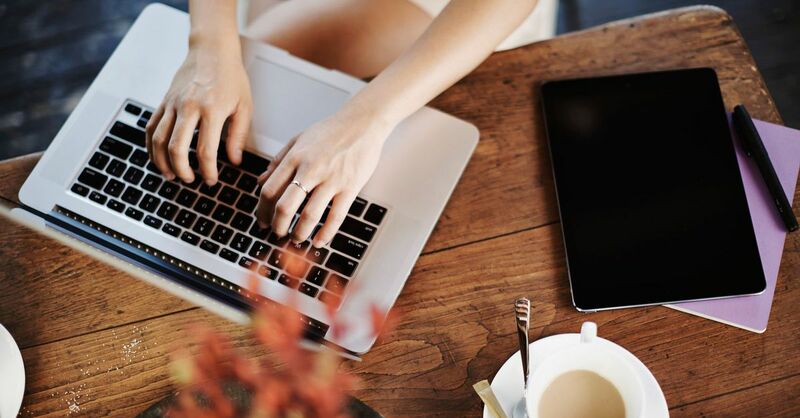 If you happen to be a Work-at-home mom (WAHM), SBI has a dedicated department and website based on their experiences with other WAHMs who started their own successful business with the help of Site Build It. Hallo All Ladys, SBI Has Special Solutions For You! My answer to you from my own experience, definitely Yes, if you work it, like all other serious businesses. SBI's well-stocked tool box is specially designed for you to succeed even if you have little web tech background, knowledge and experience, they are also very good at coaching people to build websites and blogs in the top 1-3% traffic-wise. They even provide rocksolid, real, honest evidence of this on their website, with a long list of what customers already and for a long time have achieved this goal, including URLs, screenshots and their Alexa top rankings. 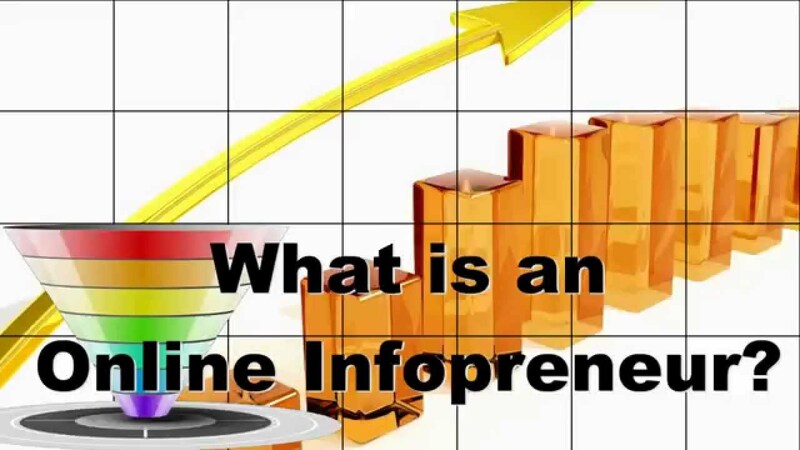 As I have said many times before, when it comes to online business, income is a logical function of the traffic. If you get traffic, you will make money for sure. For most people who will build their website/blog and a real online business, is to build traffic is the key limiting factor, as you already understand so want SBI help you to solve this problem. I really recommend you to look at this Video Tour about SBIs Website Tool. Is this website tool right for your Small Business? I do not know about you or your business.. But i know that the best way for you to find out for yourself. 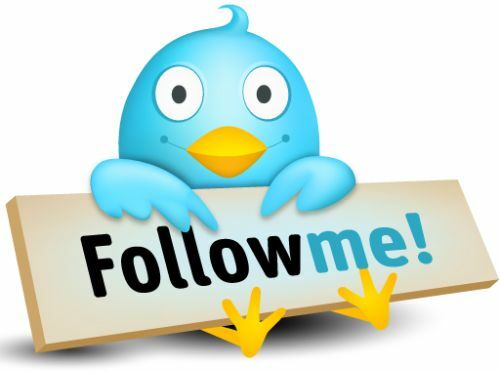 Is to follow me and many 100s of thousands of small businesses, who use it. And of course you can test drive it, to see if it's right for your Small Business.. I have since more than 30 run a small business. When it comes to the SBI, so is my own personal experience, that this website tool is an excellent problem solver. To help small business owner to build and handle their business website by yourself. So absolutely..
And most important of all is, that today people expect to find a mobile friendly business site, when they are searching for products or services. Are you thinking about make an midlife career change? Quite honestly.. Not only will this website tool help you out build your own top-mordern business site and a real e Business, but it will give you a huge step forward in the internet era, your own personal development, and it is extremely fun, to run your own small web business I think. Simple mistakes that can ruin your marketing.